The other morning, while photographing in the Joseph Smith Memorial Building, I noticed the chandelier hanging in the center of the room. How could I not photograph something so elegant? The longer exposure allowed the lightbulbs to have that starburst effect, which I really liked with this photo. 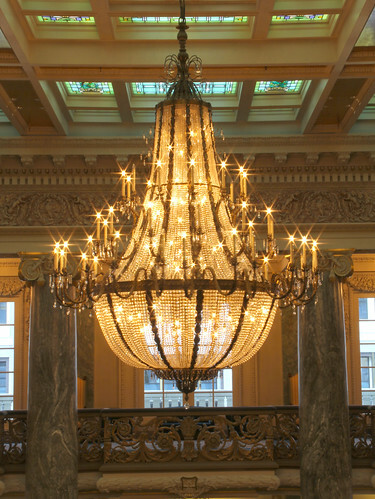 Otherwise, it would have just been any other chandelier, right? That morning I was also playing with some HDR in the grand lobby (which I will share in another post), so I gave this chandelier a shot, too. When I combined the photos in Photoshop CS5 today, the third +2 exposure compensation photo made the whole photo look terrible – which means the above photo is a combination of only 2, but I think it turned out pretty snazzy.